I'm going to see The Damned in the beginning of May. Saw them a couple of years ago and they still sounded as good as ever. Good to hear that. Musicians often get wobbly when they get older. 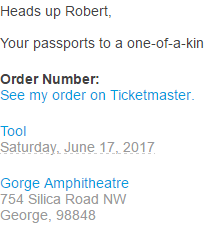 TOOL tickets arrived last night. Your passports to a one-of-a-kind live experience are shipping shortly by US Mail. Cloud Nothings still remains my favorite concert hands down. I'd kill to see them again. im hoping to see them this summer but idk if it's in the budget. will be destroyed if i miss them again.